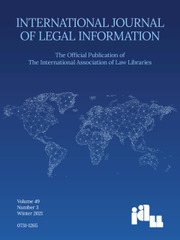 The International Journal of Legal Information is the official publication of the International Association of Law Libraries. Publishing three times a year, it seeks to advance the exchange of legal information throughout the world. Under the direction of its international editorial board and advisors, the IJLI serves the global community of law librarians, legal scholars, and practitioners through the publication of original articles, conference papers, bibliographies, book reviews, the International Calendar of conferences and events, and other documents concerning all aspects of law and law-related information.